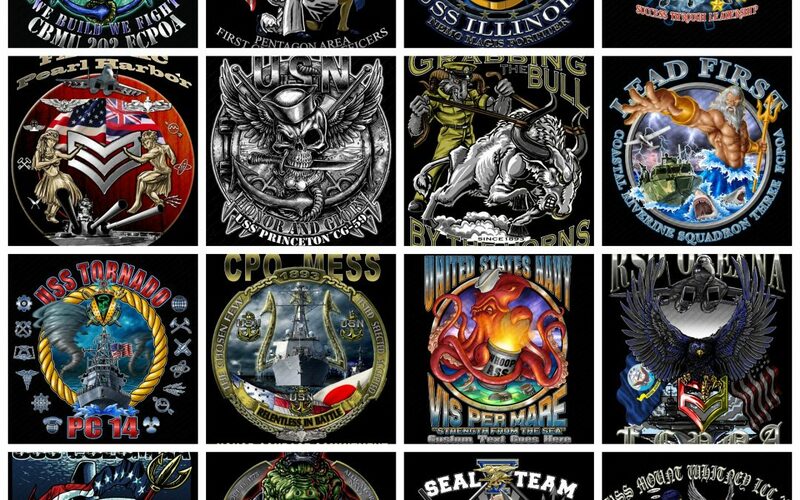 Top US Navy Copyrighted, Licensed and Appoved US Navy designs of 2016 represent the start if a busy year creating custom US Navy artwork and military graphics for the amazing men and women of the United States Navy. 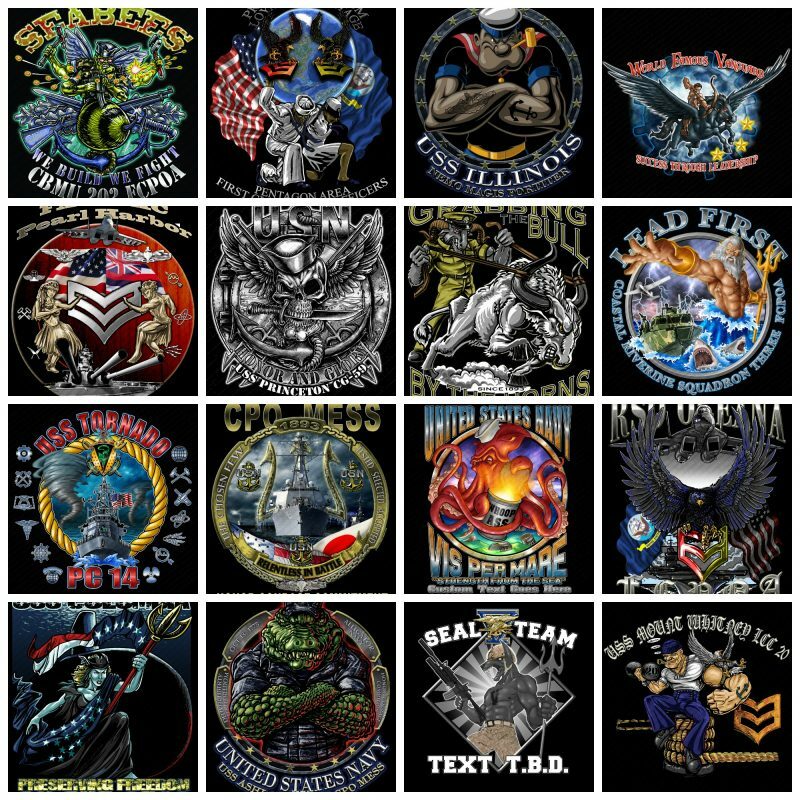 These razor sharp custom US Naval designs are found on a variety of military tees and shirts, posters, decals, drinkware and much more. Our Junior Enlisted, Senior Enlisted, Petty Officers, Chief Petty Officers and Commissioned Officers have been instrumental in the collaboration of designs in the past and in 2016 we look forward to more great designs for the United States Navy. Just completed for the US Navy is this Fleet Area Control Surveillance Facility FACSF Pearl Harbor design. A lot of history here wrapped all into a colorful US Navy design for this FCPOA. A Westpac shirt theme for the US Navy Chiefs aboard the USS Ashland was created featuring the US Navy Gator Navy Alligator. The creation of the FCPOA Naval design for Patrol Squadron was a conference with the art team of VSW and the US Navy Sailors of VP-10. 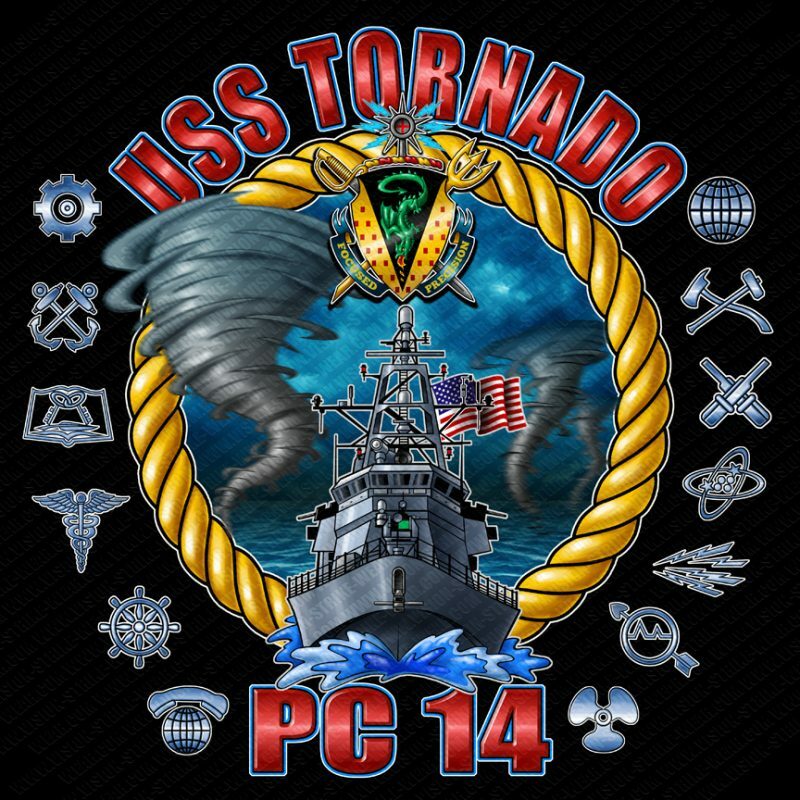 A great collaboration of art and US Navy insight culminated into their FCPOA shirt design created for this amazing squadron. A design recently created for the First Class Petty Officers aboard PHIBCB 2. 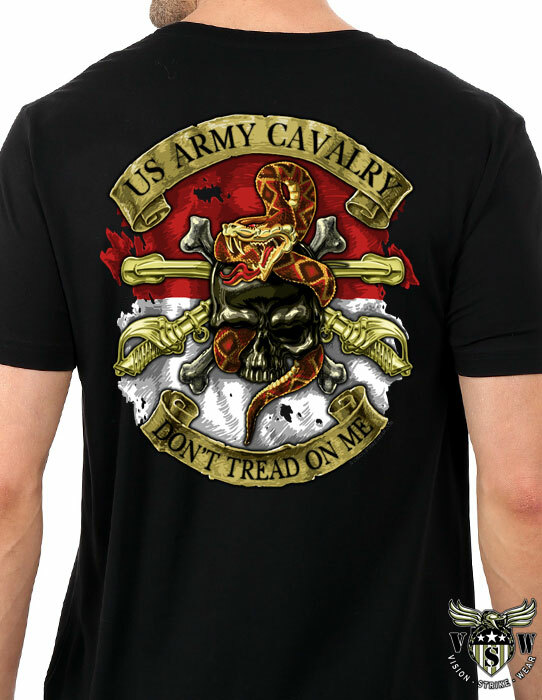 A design featuring alligator and crow sumbolic of the amphibious forces and the crow (1st Class Petty Officers) of the United States Navy!. A recently created “Mardi Gras” design for NBHC Belle Chase Unted States Navy. Something designed at the request of their FCPOA. Outstanding PRT! Naval Construction Group 1 shirts! Naval Beach Unit 7 received this design in 2015. NBU-7 was fantastic to work with! The Checkmates. VFA-211 Hello Brutus! MALS-24 CPO Mess We Steer The Course Shirt design for their Goatlocker! Vision-Strik-Wear.Com is honored to participate withthe organization Help Heal Our Vets, HHOV, by working with them to support their mission and role creating fundraising opportunities in support of our US military veterans. Inspired, contemplated, suggested, ripped, approved, critiqued and tested by United States Navy Chiefs throughout the United States Navy comes this Goatlocker Tavern Navy Chief shirt. After delivering shirts to the Navy Chief selects at NAS Whidbey Island one perfectly rainy Pacific Northwest day we sat down and spoke with a few past and present US Navy Chiefs in their goatlocker as they exhanged salty sea stories and let me tell you they are more amazing than you can imagine, we got a chance to take out a pencil and some scratch paper made up of a bar napkin and began to take down their suggestions and ides for how to create a US Navy Chief Goatlocker design they thought would be better than a blast of saltwater to the face. After a few minutes the Goatloacker Tavern Since 1893 shirt design concept was conceived. Born in a bar, ie Chief’s Mess and no not every Chief’s Mess is filled with lovely bottles and spirits, the old salty dog stories filled with a few olives and a Mariner’s blessing and this US Navy design was ready to set sail. Our many thanks goes out to the Navy Chiefs we had the most amazing time with and for their invitiation to sit with them in their den of US Navy solitude as we listened to generations of US Navy Chiefs discuss the Navy, their brothers and sisters, its history, honor, courage and the committment of what it takes to ensure the longevity and desire to maintain the finest naval power in history. Stationed overseas at one or several of the United States Naval Air Stations? Keflavik, Subic Bay or perhaps you were in Sicily or even Jacksonville or Pensacola but you were there. You might have worked with the aircraft on the tarmac, administratively in support of a US Navy squadron, or performing medical assistance as a Hospital Corpsman? Truth is you served and whether your job took you to Pearl Harbor or colder destinations somewhere in the far reaches of the globe you served honorably with the United States Navy! What is a Naval Air Station? Wiki ~ A naval air station is a military airbase, and consists of a permanent land-based operations locations for the military aviation division of the relevant branch of a navy. These bases are populated by squadrons and their support commands. They are located all over the world and are selected based on their tactical and strategic importance to the defense and support of the Navy in a specific region of the world. So like a vacation to some balmy tropical destination while on some family vacation you pick up shirt at some local off the beaten path destination like Uncle Zim’s US Navy Frog Shack or Haze Gray and Underway Shirts & More but it does get better! Uncle Zim and Haze Gray do not have your NAS shirt and they certainly have no idea the years and time you spent removing the barnacles from a warship or chipping 150 pounds of ice of the wings of an F-18. But guess what? Your shirt exists!